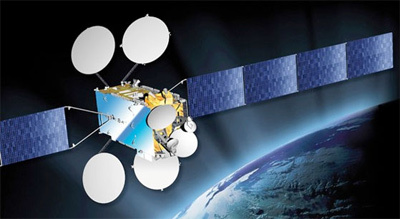 Eutelsat Communications announced the order of a of a new Spacebus 4000 C3 satellite from Thales Alenia Space in October 2012. Called Eutelsat 8 West B, the high-capacity spacecraft will be launched in 2015 to 8° West, joining satellites already operated at the adjacent 7° West position by Eutelsat and the Egyptian satellite company, Nilesat. Broadcasting services from both positions are received by satellite TV homes with a single small Direct-to-Home dish. With a rapidly growing audience and channel line-up, the 7/8° West video neighbourhood is one of the most dynamic in the global satellite TV market. Over 30 million homes in North Africa and the Middle East are already equipped for DTH reception of more than 800 Arabic and international channels broadcast at this position by Eutelsat and Nilesat. Free-to-air accounts for the majority of the offer (500 channels), while HD take-up is accelerating, currently representing 50 channels. The additional capacity will meet further expansion in a satellite broadcasting market where capacity demand for video services is forecast to grow by 6.8% a year over the coming five years (source Euroconsult). HDTV channels are expected to increase fourfold over the coming ten years. The Eutelsat 8 West B satellite will be equipped with 40 operational Ku-band transponders designed primarily to serve DTH markets in North Africa and the Middle East. It will also introduce a C-band mission to 8° West, with 10 operational transponders connected to footprints covering the African continent and reaching west to South America. To respond to the popularity of the 7/8° West neighbourhood, Eutelsat will redeploy an existing high-power Ku-band satellite to 8° West in 2013. This will increase resources in advance of the launch of Eutelsat 8 West B, enabling more broadcasters to benefit from a prime neighbourhood.